Preschoolers, school kids and grown-ups who thought their school-lunch days were a thing of the past dined on chicken nuggets, veggie tots and butterscotch pudding on Wednesday at Butch + Babe’s in Burlington. The Old North End restaurant hosted a cafeteria-style dinner to benefit the Burlington School Food Project. The event raised $150 for the district’s food program, but its primary purpose was to raise awareness, according to Butch + Babe's owner Kortnee Bush, who is a former Burlington School District cook. A school cook needs to be “tenacious” to get kids to try new and healthier foods, she explained. “They don’t eat spaghetti squash until you present spaghetti squash eight times,” Bush said. At Butch + Babe’s school-lunch event, the vegetables were roasted broccoli, garden salad, and veggies tots made with broccoli, cauliflower and potatoes. These were paired with a main course option of chicken nuggets, meatloaf or “meatless” meatballs with tomato sauce. 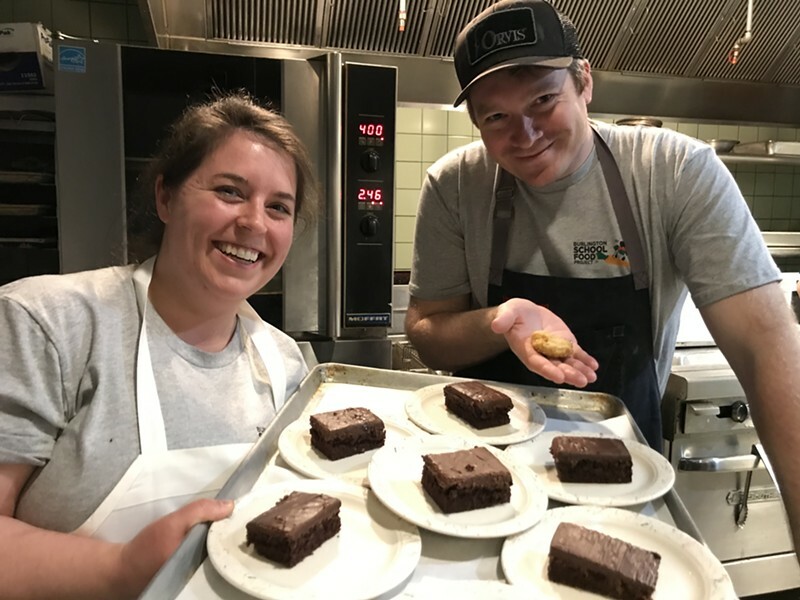 Diners were served their cafeteria-style meal by Burlington school cooks and by chefs Jackie Major of Butch + Babe’s and Jordan Ware of Hen of the Wood. Guests ate from compartmentalized plastic trays — a serving vessel that proved to be a flashback for some attendees. “I sat down and I thought, Oh my God. I thought I left this part of my life behind,‘’ said Derek Desranleau, 29. He arrived for dinner and a drink with friends after a yoga class, unaware of the school event. In his mind’s eye, Desranleau saw the “heathered pea-green tray” he ate from 20 years ago at St. Francis Xavier School in Winooski. Mike Bernier, 30, a carpenter who works at Shelburne Farms, also ate a post-yoga, caf-style meal. “It was fun,” Bernier said. “I feel like [the tray] made me eat slower and think about what I was eating.” He grew up in Worcester, Mass., and said his childhood school lunches don’t compare with Butch + Babe’s recreation. 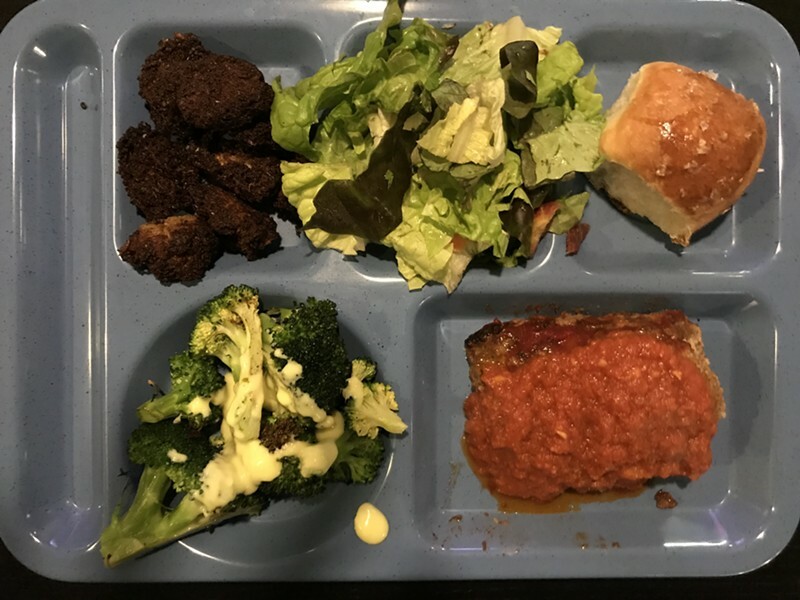 Grace White, 9, ate the caf-style meal that her mother, school cook Holly Thompson, helped serve. At Malletts Bay School in Colchester, where Grace is a fourth-grader, she said she's guided to make healthy food choices by signs that illustrate food groups. Her meal at Butch + Babe’s was “yummy and delicious,” Grace said. It included her favorite healthy food, carrots and salad, and her favorite "unhealthy thing." That's chocolate cake, which was a dessert option along with butterscotch pudding and whipped cream. Kaye Douglas, a cook at Champlain Elementary School, noted that the Butch + Babe’s meal was “on the higher end side” relative to food served at schools. She pointed in particular to the Parker House rolls — 160 of them made the scene — from Hen of the Wood. “Kids would eat 20 of them,” Douglas said. Ware’s sister, Kate Dupee, is a cook at Burlington High School. She worked the cafeteria line with her brother the other night and talked about watching BHS students move from eating pizza to made-to-order stir fry seasoned with sesame oil, chopped ginger and garlic. “You see their flavors bloom,” Dupee said. Major, the Butch + Babe’s chef, said she and Ware looked at a few school menus before planning theirs. The food at the fundraiser was exactly what she loves to cook, Major said.